Reports give your team the insights they need to sell smarter. See a high-level description of reporting in SalesforceIQ here. Getting Started: To get the most out of your reports, be sure to set up your Lists according to our best practices. Select the List to report on from the drop-down menu in the upper-left corner. Select the report type from the navigation panel on the left side of the screen. 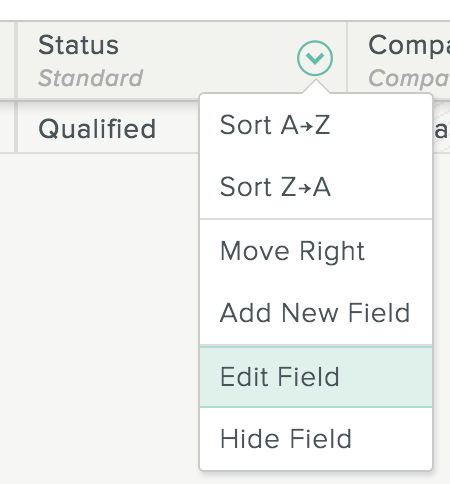 Drill down on your data by pivoting on fields in your List. In the report grid, click the arrow to the left of the Total heading, and then select the field you want to pivot the data on. The available fields vary depending on the report type. For most reports, you can report on the Status or Owner field. 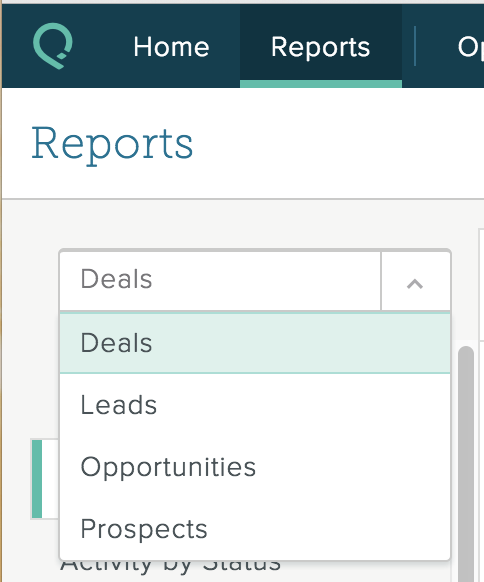 For Pipeline Value, Cumulative Deals, Incremental Deals, and all Sales reports, you can also report on single select and multi select fields, as well as a specific List object (such as a lead or opportunity). 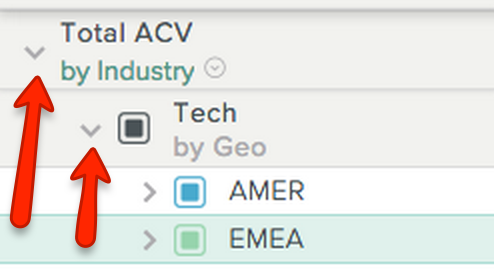 In this example, click the arrow to the left of Total ACV to view your cumulative sales by industry, and then click the arrow to the left of Tech to view tech sales by geographic region. You can also click on the field name or the arrow to the right of the field name to change the field you are currently pivoted on. 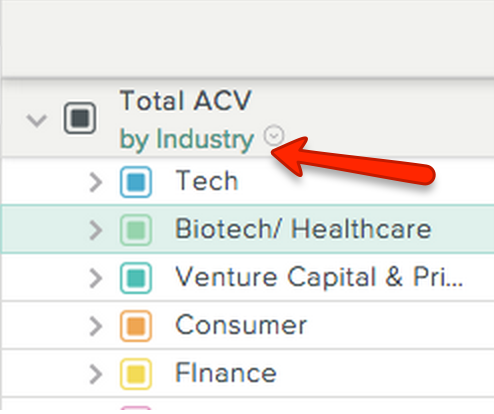 In this example, click by Industry under Total ACV. Note: For some report types, the option to click on the field name doesn't appear unless you use the first option to drill down on the data. 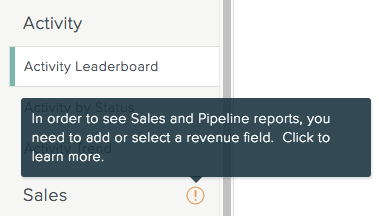 For Sales and Pipeline reports, you are prompted to define the field you want to base your reports on—for example, ACV, Revenue, Deal Size, etc. This becomes the designated reporting field for this List. Note: You must select a numeric field type for your designated reporting field. Only one of these fields can be your Revenue field for Sales reports. Choose this field based on how you want your Sales reports to populate. Sales and Pipeline reports are based on the last active status that you indicate in your List settings. You may need to reconfigure your List statuses to ensure the last active status captures when a deal is won. This section describes each report in detail. Based on: All outbound activities (emails, calls, meetings, tasks) from any user in the Organization within any status. The author of the activity receives credit for each activity. Activity Leaderboard—Ranked list of users based on their outbound activity. Activity by Status—Amount of activity that takes place within each status. Activity Trend—Amount of outbound activity over time. Based on: Last active status of the defined List and defined Revenue field for the List. Cumulative Sales—Total revenue over time based on this List's last active status. Incremental Sales—Value of new deals that were added during the selected date range. Sales Leaderboard—Ranked list of users based on their revenue. Average Deal Size*—Average size of the deals that entered this List's last active status. Note: If you don't list revenue for a deal in your last active status, it won't be included in the average deal size calculation. Three deals have reached the Deal Won status. Two of the deals have values listed in the designated Revenue field ($10 and $0), and one doesn't have a value entered. Average Deal Size is $5 ($10/2). For all Sales reports except Average Deal Size, you can include a forecast of the probability of closing and expected close date. For additional information, please see our Reporting FAQs. Based on: All deals, opportunities, leads, etc. on the defined List with any active status except the last active status. Pipeline Value—Estimated value of your pipeline based on the values in your revenue field. Cumulative Deals—Total deals beginning at the selected time range and their status as of today. Calculation: Deals created during the selected time period and their current status (functions the same as Cumulative Sales, starting at 0 for each time period). The counts accumulate over time in Cumulative Deals, while Incremental Deals shows new deals created only. Incremental Deals—New deals added during the selected date range and their status as of today. Funnel Analysis—How deals are moving through your pipeline. The date range you select incorporates any List items that were in that status as of the start date or added during the date range. % From Top—Percentage of overall deals that converted to this status. % To Next—Percentage of deals that converted from this status to the next active status. Win Rate—Percentage of deals that have both entered this status and reached the Deal Won status. Note: We assume that any deal that reaches a given status has also passed through all previous active statuses. 20 leads entered the pipeline. 10 eventually were won. The win rate for leads would be 50%. Progressed—Number of deals that moved to another active status during the specified date range. Remained—Number of deals that remained in a given status as of the last date in the date range. To Inactive—Number of deals that went from this status to an inactive status during the specified date range. Win Rate by Owner—Percentage of deals that are won after reaching each status. Average Stage Duration—How long your deals remained in each status before moving to the next stage of your pipeline. Note: We make this calculation only for deals that have moved to another status. If a deal remains in a given status, it doesn't affect the duration until it is moved to another status. Three deals enter the Leads status on February 1. Five days later, one of those deals moves to another status. Two days after that, another lead moves to another status. The third lead remains. Average stage duration for Leads is 6 days: (5+7)/2=6. There are two categories of status: Active and Inactive. Use Active statuses to keep track of deals that your team is currently working on or has successfully won. Use Inactive statuses to move deals out of your active pipeline if you will no longer pursue them—for example, if you won't pursue a deal for at least 30 days, or if you lose a deal. Your active statuses should reflect your current sales pipeline and represent key stages of your sales flow. Your team should update a deal's status regularly to receive the most accurate reports. 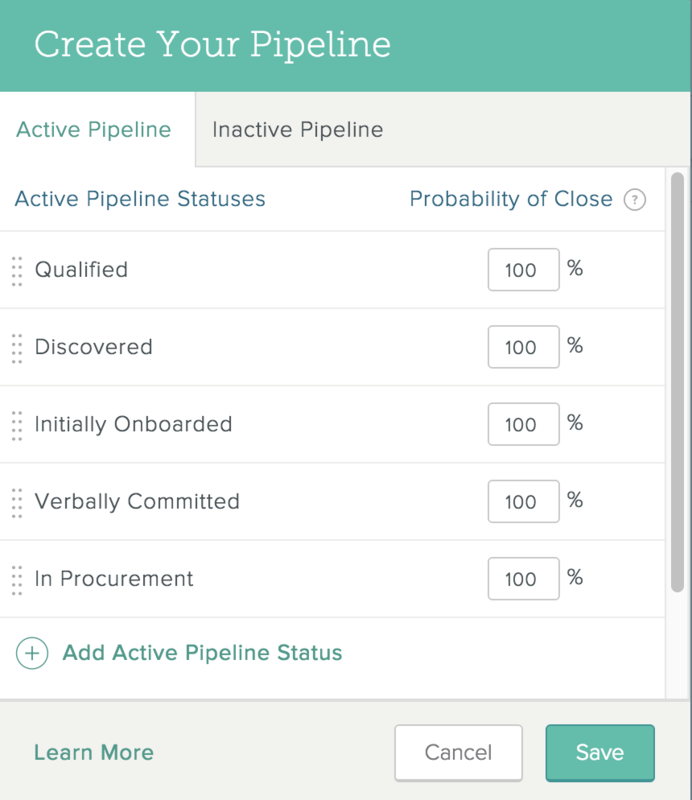 All Sales and Pipeline reports are based on your last active status—Deal Won in this example. Inactive statuses are removed from your active pipeline. To report on revenue or other numeric values, you need to have a numeric field on your List. If a numeric field exists on your List, when you select your first Sales or Pipeline report, you are prompted to select the field to set as your Revenue field. Click and select the field. If a numeric field doesn't exist, you are asked to create one. As you add opportunities or other objects to the List, we recommend inserting the estimated value of the deal within the selected Revenue field. To ensure better accuracy in your reports, you should update these values over time as new information becomes available. Sales and Pipeline reports pull in this designated Revenue field value. For Sales reports, SalesforceIQ uses the value of all deals that are currently in your List's last active status. Pipeline reports pull in the value of all deals that are in an active status except for the last active status. 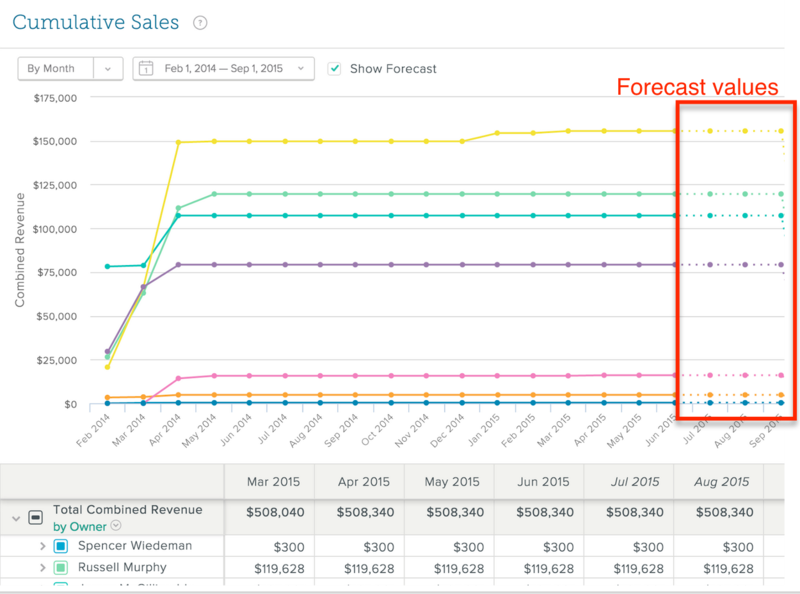 SalesforceIQ forecasting provides clarity into your funnel, which helps you hit your goals and efficiently allocate your resources. In the status editor, customize the probability of close for each status. Note: Only Organization admins can change the probability of close for a status. In addition, this feature is available for supported SalesforceIQ plans only. In the Grid, click the arrow to the right of the Status field header and select Edit Field from the drop-down menu that appears. Click the Active Pipeline tab. For each active status, under Probability of Close, enter a value between 0 and 100 to indicate the probability percentage. The default value is 100. Note: You can't leave a probability field blank. Note: The default close date for a deal is 30 days after the created date. Any user can change the expected close date for a given deal by following the steps shown here. In addition, Organization admins can change the default close date to a value other than 30 days. 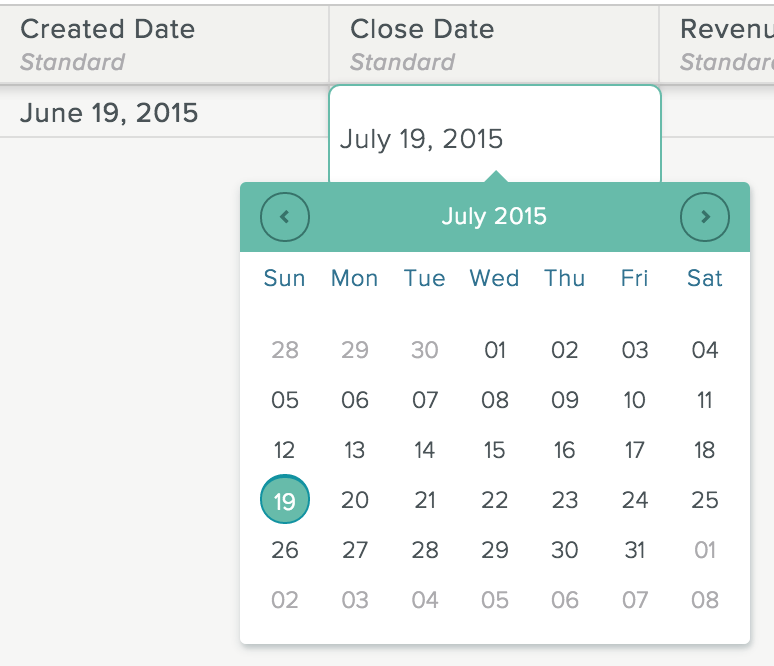 In the Grid, double-click the Close Field date for the specific deal. Enter the expected close date, or select it from the calendar. Run the report as described here. Check or uncheck the Show Forecast box to set whether the forecast does or doesn't appear in the report. Forecast values appear in the pivot grid.